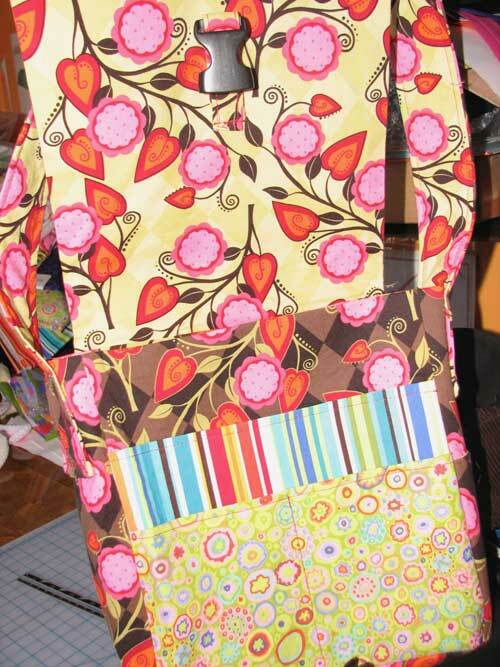 Here’s an update on my latest crafty creations and swaps! My first real complicated bag (for me anyway!) 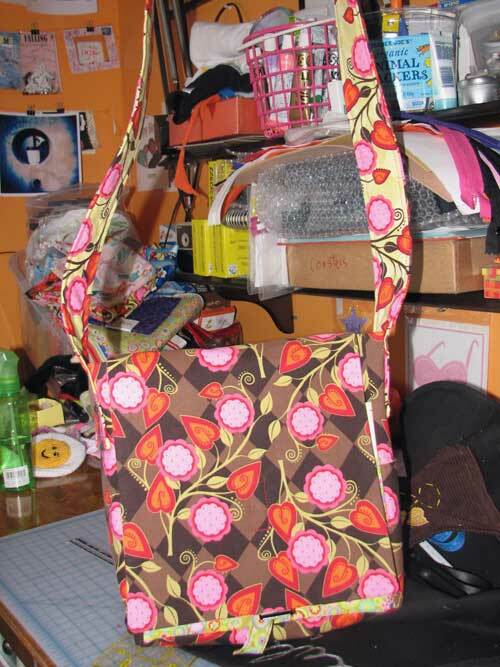 A messenger type bag from the New Handmade book. The biggest pain about this bag was just cutting out all the pieces. I just got to be patient and realize it cannot be done in a day! This was for a handmade whatever you want swap. 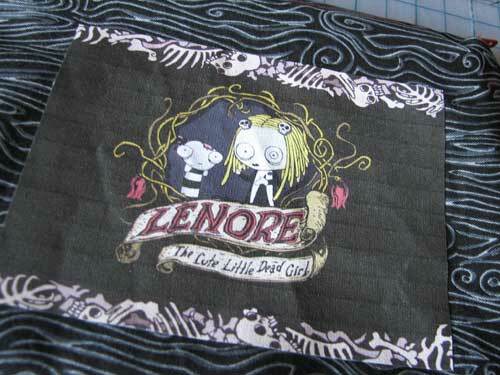 My partner is a fan of Lenore and since I have not heard of her, was very intrigued. 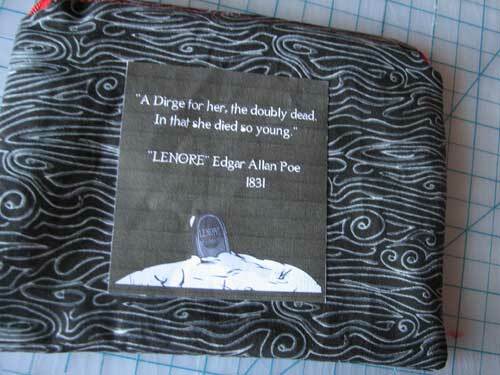 She’s a fictional character created by Roman Dirge and inspired from a poem by Edgar Allan Poe. She is quite interesting and macabre! I haven’t watched all the videos yet. 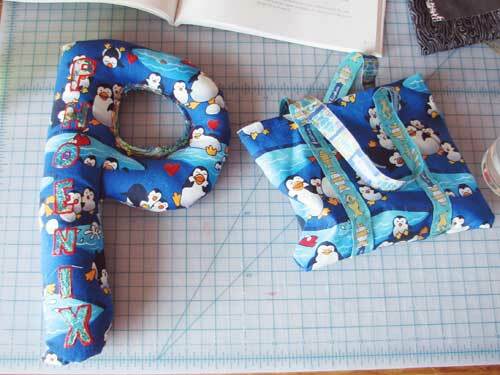 This was for a Wacky and Unusual June Holidays swap. I procrastinated on this so sent it late but once I got into it, it was fun! 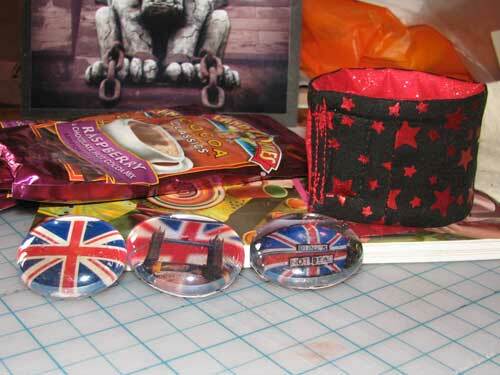 My partner likes the Union Jack flag so made these photo magnets with photos from flickr for Flag Day. 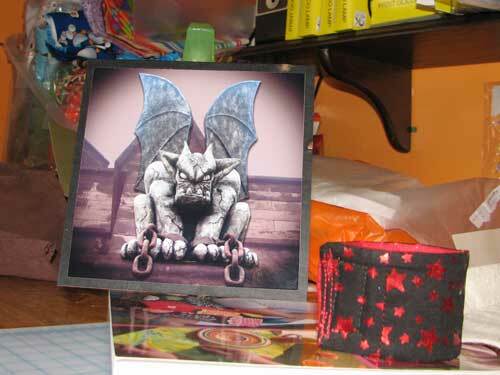 She likes gargoyles so I altered the gargoyle photo I took from Eastern State for Camera Day. She likes hot cocoa so sent her that for Name your poison day. 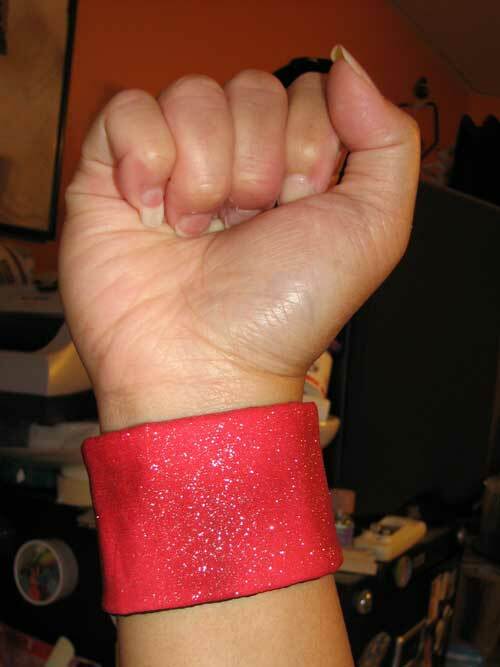 And then I made her this reversable cotton cuff (from the New Handmade book) for Sewing Machine Day. Close up of the photo and the cuff. I really liked how the photo turned out! 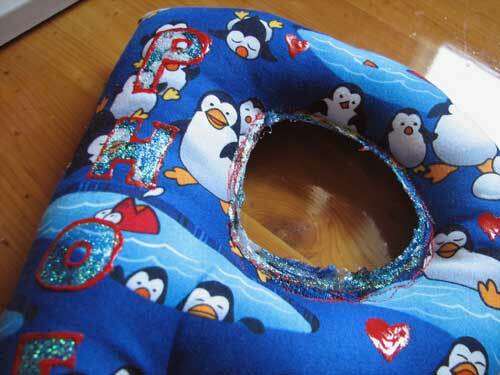 Wearing the cuff and showing the reverse side. 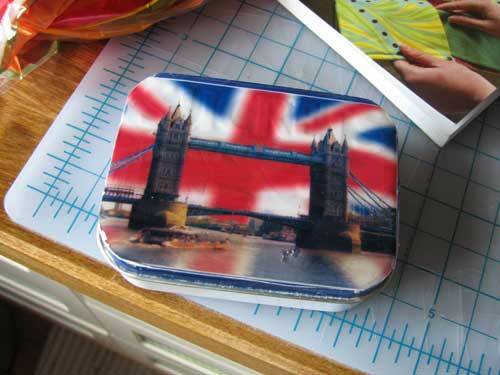 I put the photo magnets in this altered Sucrets tin. 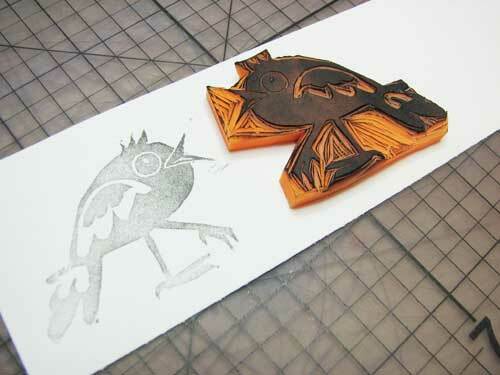 Here’s a bird stamp I carved for yet another swap! 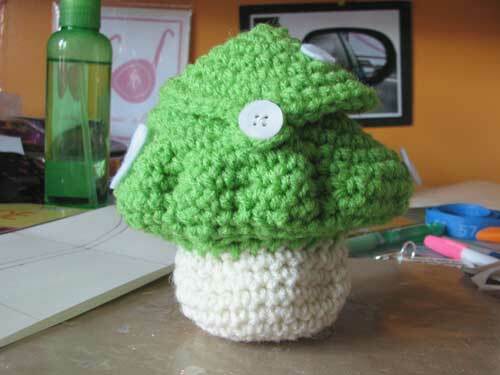 And just so you know that not everything I try works out, here is a hat I attempted to make. I had to take measurements of my head and make a template. It was actually pretty easy to do. I know my error tho. Since I wanted to make it easier on myself, I had rounded out one of the measurements I made (and a very important one at that!) and found out that it really messes the whole thing up. I will try it again! Good thing I practiced on old sheets! 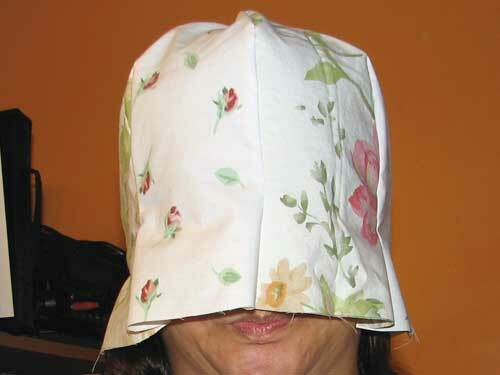 You look like a human toilet tissue cozy in that last one. Lol. You are really fantastic. How do you find the time to do all those things with a little person in tow ??? I like the birthday gift idea. Its a great one..